Above video: San Miguel Archangel Parish Church in Argao boasts an ornate facade and equally intricate interiors. The Roman Catholic church’s vaulted ceilings are covered with murals that portray various Biblical scenes, such as the temptation of Adam and Eve, and the battle between the good angels of St. Michael and the fallen angels of Lucifer. The facade of San Miguel Archangel Parish Church in Argao boasts various carvings of its patron saint, while inside, its ceilings are adorned with colorful paintings depicting angels and archangels, as well as several scenes from the Bible. These paintings were completed by master Cebuano painter Raymond Francia, along with another unnamed Boholano artist. You can’t miss this larger-than-life landmark located at the heart of the heritage town of Taal in Batangas. 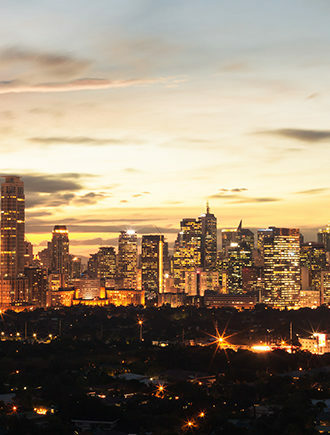 At 96m long and 45m wide, it holds the title of the largest Catholic church in Asia. First built in 1575, it has since been refurbished several times, due to damage wrought by natural disasters. Today it boasts a Baroque-inspired façade, with a large church bell, hand-painted domed ceilings and a silver tabernacle. Also known as the Grand Mosque of Cotabato, this 5,000sqm edifice is the largest mosque in the Philippines — it’s even visible from the Moro Gulf! Funded by Hassanal Bolkiah, the Sultan of Brunei, it can accommodate around 800 male and 400 female worshippers. It’s a real sight to behold, with its white walls, gold-painted domes embellished with crescent moons, and four minarets that stand at 43m. If its blue-green pastel hue doesn’t catch your eye, its striking Neo-Gothic architecture definitely will. 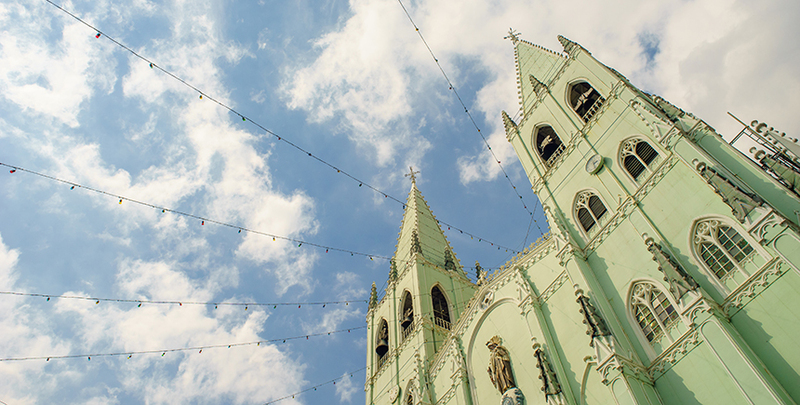 Built in 1890 in Quiapo, Manila, San Sebastian is the only steel-vaulted church in the country, with two pyramidal spires, an intricate rose window, colorful stained-glass panels and crystal chandeliers that highlight its attractive interiors. It’s definitely one of the most stunning places of worship in the city, and is a highly popular site for weddings. The Visayas region is home to many magnificent Spanish-era churches, including this stunning UNESCO World Heritage Site. Completed in 1797, the church (also known as Sto. Tomas de Villanueva Parish Church) flaunts a lovely Baroque aesthetic, with an ochre façade and an ornate relief sculpture of St. Christopher, flanked by two large belfries. The building was once used as a fortress against the Moro invaders, so you’ll find that its foundations are 6m deep, with solid walls that are 1.5m thick. Otherwise known as Saint Augustine Church, this is one of the few remaining Baroque churches in the archipelago. It’s famous for its distinct, hardy architecture — think 1.67m-thick walls made of brick, coral and lumber, as well as 24 massive buttresses built to withstand any seismic activity. It also has a three-storey bell tower that served as an observation post during World War II. Today, the church has been designated a UNESCO World Heritage Site, and is one of the biggest tourist attractions in the region. The ivory image of Our Lady of the Rosary of Manaoag in this Spanish-Romanesque church is believed to have curative powers, so devotees from all across the globe flock here to pray for good health — especially during the Lent and Easter seasons. Enormous paintings depicting health miracles also adorn the interiors of the church. Even non-Catholics will be awed by the resplendent ruins of San Pablo Church — the oldest church in Isabela. Built by Spanish friars in 1624, the church is fashioned from adobe and coral, and its bell tower is said to be the tallest in the Cagayan Valley region. While the entire church was nearly destroyed during World War II, it has since been restored admirably, enduring as a house of worship for its faithful parishioners.